Voters in Ann Arbor elections held on Nov. 8 confirmed the city’s general preference for incumbent candidates, both on the city council and on the school board. Out of a field of six, voters gave the two incumbents on the Ann Arbor Public Schools board of trustees – Andy Thomas and Simone Lightfoot – each a four-year term. And the preference for Democrats, which the city of Ann Arbor has shown in recent years, was generally also confirmed in Tuesday’s city council results. Four of five Democratic incumbents were given another two-year term on the 11-member body. Sabra Briere (Ward 1), Stephen Kunselman (Ward 3), Marcia Higgins (Ward 4) and Mike Anglin (Ward 5) all easily kept their seats. The lone Democratic incumbent who lost was Stephen Rapundalo. He was defeated on Tuesday by Jane Lumm, who served previously on the city council as a Republican, but who ran against Rapundalo as an independent. Rapundalo himself is a former Republican, but served three terms on the council as a Democrat. Ann Arbor voters also said yes to all three proposals on Tuesday’s ballot. They approved a renewal of the 2.0 mill street repair tax, the addition of a .0125 mill sidewalk repair tax, and a change to the composition of the city’s retirement board of trustees. Sylvan Township voters were in a less agreeable mood, voting to reject a 4.75 mill tax that would have been used to reimburse Washtenaw County for some bond payments on which Sylvan will likely default in 2012. The county will likely file a lawsuit to recover the money through a property assessment. In The Chronicle’s travels to polling stations throughout election day, turnout was described by precinct workers as light to moderate. It ranged from a low of less than 1% in three predominantly university student precincts, to a high of 26.6% in Precinct 5 of Ward 2 – the ward with the most hotly contested race. Countywide, turnout was 11.24%, according to the county clerk’s office. However, several election workers noted that percentages are hard to gauge, given that many voters are still registered even if they’ve left the area – as is the case with many voters who register as college students. Complete results are available on the Washtenaw County clerk’s election results website. Ann Arbor’s city council includes the mayor and two members representing each of five wards, for a total of 11 members. They all serve two-year terms, which are staggered so that in any given year, one seat from each ward may be contested. The mayor’s term is keyed to even years, so this year was not a mayoral election year. In Ward 2 this year, the race between three-term incumbent Stephen Rapundalo and independent challenger Jane Lumm was expected to offer the greatest chance for a challenger to defeat an incumbent. And Lumm prevailed by a comfortable margin. Among all voters in Ward 2, Rapundalo had 1,359 votes (39.5%) to Lumm’s 2,079 (60.4%). The absentee votes were counted separately from ballots cast at the polls on Election Day and those results came first Tuesday night, with the indication that Lumm stood a good chance of winning the ward – absentee votes are counted by ward, not by precinct. Among absentee voters across Ward 2, Rapundalo had 268 votes (36.7%) to Lumm’s 461 (63.1%). Rapundalo won a majority of votes in just two precincts – Precinct 2, where he received two of the three votes cast, and Precinct 9, where he received 218 votes to Lumm’s 194. The voting patterns in Rapundalo’s past city council races have included an extraordinarily strong showing by Rapundalo in the two northern precincts near his neighborhood – Precincts 9 and 6 – which has previously made up for deficits in other precincts. That makes the council’s Nov. 10 meeting Rapundalo’s last one. This year, as always, the council’s regular meeting was pushed from Monday to Thursday due to the election on Tuesday. So Lumm’s first opportunity to attend a gathering of the council will be at its Nov. 14 work session, when it will take up the issue of the city’s public art program and downtown parking rates (in a joint session with the Ann Arbor Downtown Development Authority.) In candidate forums and other venues, Lumm has stated opposition to using millage proceeds for public art, which the city’s Percent for Art program does. Lumm will be ceremonially sworn in at the council’s Nov. 21 meeting. This will be her fourth term on the council – she served three terms in the mid 1990s. In Ward 1, Democratic incumbent Sabra Briere was unopposed in Tuesday’s general election, just as she had been in the Democratic primary. Typically, unopposed candidates will still not receive 100% of the vote, because some voters will write in names for a write-in candidate, even if no one has registered as a write-in candidate. Briere received 1,149 votes (95.27%) against 57 (4.73%) write-ins. The race in Ward 3 was between Democratic incumbent Stephen Kunselman and Republican challenger David Parker. Kunselman received 1,738 votes (77.3%) compared to Parker’s 482 (21.4%). Kunselman won every precinct with over 70% of the vote. Kunselman was first elected in 2006, but lost his seat to Christopher Taylor in 2008. He came back the next year to defeat Leigh Greden. This next will be Kunselman’s third term (though not successive) overall. The race in Ward 4 was between Democratic incumbent Marcia Higgins and Republican challenger Eric Scheie. Scheie had the strongest showing of the three Republican challengers. Map B. Ward 2 is colored light blue. Ward 4 is colored yellow. The magenta dots are addresses that made monetary contributions to Jane Lumm's Ward 2 campaign. In Ward 4, Precinct 9 (with bolded border) there was a cluster of Lumm contributions. Republican Eric Scheie won that precinct in Ward 4. Higgins received 1,488 votes (58.8%) compared to Scheie’s 1,013 (40.1%). But he actually carried Precinct 9 with 54% of the vote – 211 votes against 180 for Higgins. Higgins was first elected to the council in 1999 – as a Republican. She switched to the Democratic Party in 2005, a year that saw Stephen Rapundalo win his first seat in Ward 2 – also as a Democrat, though in 2000 he’d run for mayor as a Republican. On Tuesday night, Higgins visited the Ward 2, Precinct 9 polls to collect the results for Rapundalo, one of only two precincts he carried. The race in Ward 5 was between Democratic incumbent Mike Anglin and Republican challenger Stuart Berry. Anglin received 2,750 votes (79.6%) compared to Berry’s 677 (19.6%). Anglin won every precinct with more than 70% of the vote and polled around 85% in some of them. Last year in Ward 5, Republican John Floyd tallied similar, but slightly better numbers than Berry, with around 22% of the vote. That was a three-way race between Floyd, Democratic incumbent Carsten Hohnke and independent Newcombe Clark. Anglin was first elected to the council in 2007. He’ll be starting his third term. Ann Arbor voters were presented with three ballot questions. On the ballot were two connected proposals, one to renew a street repair millage at a rate of 2 mills and another to add another 0.125 mills to support sidewalk repair. The sidewalk repair millage hinged on being approved in its own right, and also on the renewal of the street repair millage. Voters approved both millages, with a majority vote in every precinct. Across the city, 10,345 voted Yes on the street repair millage (77.3%), while 3,038 voted No (22.7%). Support for the sidewalk millage was not as strong: 8,010 voted Yes on the sidewalk millage (60.1%), while 5,314 voted No (39.9%). In one precinct – Ward 4, Precinct 9 – the sidewalk millage only very narrowly achieved a majority. Voting to approve the sidewalk millage in 4-9 were 206 people (52%), compared with 193 (48%) voting against it. Negative sentiment about the sidewalk millage was based on a variety of issues. Some voters felt the city could take over responsibility for sidewalk repair without an additional levy. Others had already recently repaired their sidewalks under a five-year inspection cycle, which just concluded, and saw it as a question of equity. Still others did not vote for the millage because they disagree with the city ordinance requiring 1% of any capital project be dedicated to support public art as a part of that project. The third proposal before Ann Arbor voters was a change to the city’s retirement board of trustees. The change retains the body as a nine-member group but distributes them differently: (1) the city controller; (2) five citizens; (3) one from the general city employees; and (4) one each from police and fire employees. Eliminated from the mix is the city administrator. Across the city, 7,977 voted Yes for the change in the retirement board composition (68.1%), while 3,729 voted No (31.9%). The measure achieved a majority in every precinct of at least 61%. Two seats – each for four-year terms on the seven-member AAPS board – were open. Six candidates sought the two slots: Albert Howard, Ahmar Iqbal, Patrick Leonard, Larry Murphy, and incumbents Simone Lightfoot and Andy Thomas. Thomas and Lightfoot won with 24.2% and 21.8% of the vote, respectively. Across the entire district: Albert Howard had 853 votes (3.5%); Ahmar Iqbal had 3,473 votes (14.4%); Patrick Leonard had 4,180 votes (17.3%); Simone Lightfoot had 5,257 votes (21.8%); Larry Murphy had 4,427 votes (18.4%); Andy Thomas had 5,838 votes (24.2%). The Ann Arbor Public Schools district includes some areas in townships outside the city of Ann Arbor. In the townships, support for first-place candidate Thomas nearly matched that inside the city – 23.4% in the townships compared to 24.2% inside the city. However, overall third-place candidate Larry Murphy moved up to second place among township voters. In the townships he received 22% of the vote compared to 19% for Lightfoot. 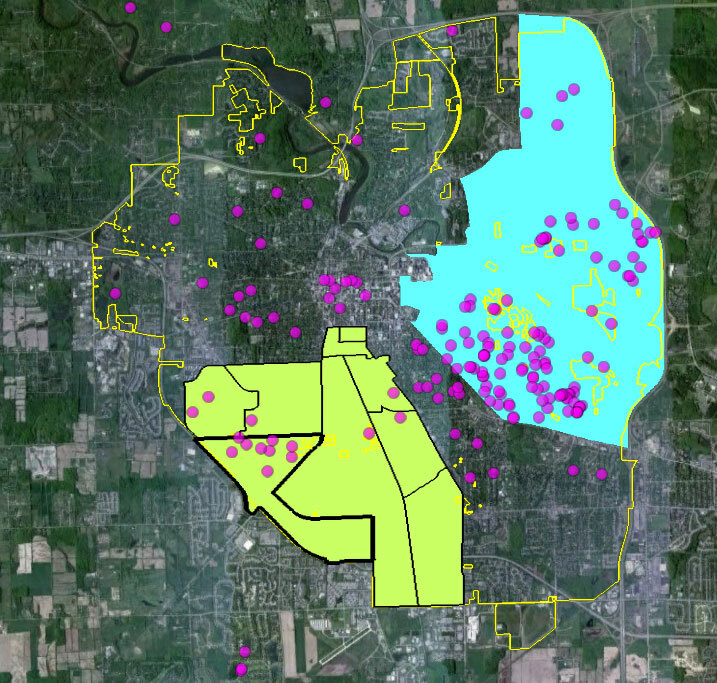 A ballot measure in Sylvan Township, located in the western part of Washtenaw County, has implications for Ann Arbor residents, because it impacts the county. By way of a quick demographic sketch, Sylvan Township’s population is 2,833, with a median household income of $72,115, according to the latest available data from the Southeast Michigan Council of Governments (SEMCOG). The largest percentage of land in the township is in agricultural use (34.7%), followed by residential (30.5%). Sylvan Township voters on Tuesday rejected a proposal to levy a 4.75 mill, 20-year tax, by a vote of 475 (59%) to 328 (41%). Proceeds from the millage were intended to help with payments on $12.5 million in bonds issued in 2001 to build a water and wastewater treatment plant that was intended for future development. The township expected that connection fees from developers would cover the bond payments, but the development never materialized and the township has been struggling to make those payments. Now Sylvan Township – located west of Ann Arbor, near Chelsea – is facing default on its bond payment in May 2012, which Washtenaw County will need to cover. Millage proceeds would have been used to repay the cost of the bond payments made by the county – the county had backed the bonds with its full faith and credit, and is ultimately responsible for making the payments if the township defaults. Even if the millage had passed, proceeds alone would not have been sufficient to cover the entire cost of the bond payments, however – forcing the county to tap its capital reserves as well. The millage proceeds were also intended to repay the county to cover any amount used from the county’s capital reserves, as well as interest. The proceeds would also have been used to repay the county treasurer’s office, which advanced about $1.2 million to the township in 2007 and 2008 related to this project. At its Oct. 19, 2011 meeting, the Washtenaw County board of commissioners gave final approval to a contract with Sylvan Township related to the township’s bond repayment schedule. However, the contract was contingent on voters passing the 4.75 mill tax, and will be nullified in the wake of Tuesday’s vote. A staff memo accompanying the contract resolution indicated that if the millage failed and the township defaulted on its bond payments, the county could file suit against the township for breach of contract in failing to meet its debt repayment obligation. Such legal action could result in a court-ordered assessment on township residents. The county is expected to make the bond payments to avoid having its bond rating negatively affected. The Chronicle could not survive without regular voluntary subscriptions to support our coverage of local government and civic affairs. Click this link for details: Subscribe to The Chronicle. And if you’re already supporting us, please encourage your friends, neighbors and colleagues to help support The Chronicle, too! Copyright 2011 The Ann Arbor Chronicle. But Higgins was ‘too busy’ to show up for the one debate for her own campaign, activate her campaign website, or actively campaign in Ward 4. Kudos to her and her campaign manager for their great respect of the democratic process. And additional kudos to my fellow Precinct 9 voters who prefered a Tea Party looney over our invisible Council Woman. THAT was some message. Andy Thomas and Simone Lightfoot will be able to finish what they’ve started and will be wonderful board members; however, we missed the opportunity to have an extremely talented candidate on the board, Patrick Leonard. I’m not sure what happened on election day, but I would tell him to please run again in a future school board election. Was anyone else shocked that Leonard placed 4th? Shocked. I had no clue the incumbents had that much support… Congrats to Andy Thomas and Simone Lightfoot. Leonard please run again – I know I’m not the only one that feels this way.